We often gawk at how important the iPhone is to Apple’s earnings, but it’s not the only company which relies heavily on smartphones for profits. 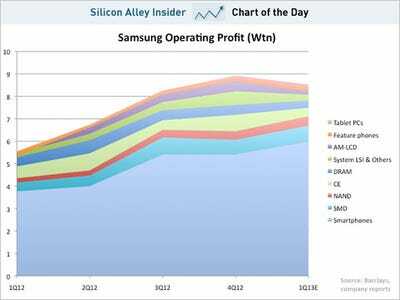 Here’s Samsung’s operating profit by division for the last year, with an estimate from Barclays for this quarter. As you can see, 70 per cent of Samsung’s profits come from smartphones. What’s different about Samsung versus Apple is that Samsung makes a lot of stuff. Apple CEO Tim Cook likes to say that you could put everything Apple makes on a table. (It would have to be a big table, but it could probably fit.) Samsung’s entire line would need a warehouse. It does TVs, refrigerators, computers, tablets, chips, LCD displays, and a lot more.